The Hooks Agency, Inc. was founded in 1903 as The Herbert Hawkins Agency. In 1944 the firm was purchased by Mr. Hawkins great nephew, T.B. (Tommy) Hooks, III and then by Mr. Hooks' sons, Joe and George in 1976. The local business has been in continuous operation for 106 years. 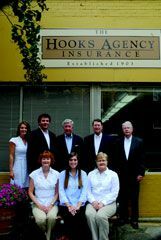 The Hooks Agency specializes in business, homeowner, auto, life, and health insurance, and represents most of the nationally known insurance companies.